Reign of the Supermen might not be a strong follow up to The Death of Superman and probably middle of the pack amongst the others within the connected DC Animated Universe, but it is pretty entertaining with some great animation. The Death of Superman was a great addition to DC’s Animated Movie line with a tight and well told adaptation of the famous story, doing far better justice than Superman: Doomsday, and some fine voice talent work in addition, though Rainn Wilson’s Lex Luthor sounded off. The Flash: The Complete Fourth Season Races onto Blu-ray & DVD on 8/28! Warner Brothers Home Entertainment has announced the date and released artwork for The Flash: The Complete Fourth Season starring Grant Gustin, Jesse L. Martin and Tom Cavanagh. 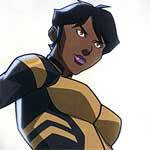 Click on the link below or image to the left to check out the features and artwork. 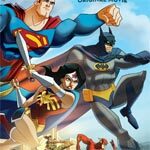 LEGO DC Comics Super Heroes: The Flash is the latest in these DTV movies and although this isn’t entirely a laugh-riot or anything, especially compared with The LEGO Movie, it was still highly enjoyable with plenty of in-jokes for the DC fans out there. The Flash: The Complete Third Season is another solid year and still one of the better shows within the DC TV brand, though that’s not exactly a high bar, but I’ve generally enjoyed them all except for maybe Arrow. JLA Adventures: Trapped in Time, unlike its DCU counterparts, is a big downgrade in quality especially with the story, but I get what the filmmakers were after: a tongue-in-cheek comedy adventure and throwback to the old cartoon series; however the humor is pretty basic and really only anyone under the age of 13 might get anything substantial out of it. 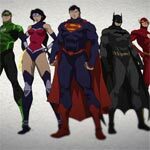 Justice League: The Flashpoint Paradox is another solid entry into the DC Universe Animated line. The movie have had quality voice talent to go along with a well paced and finely tuned adaptation work providing for provocative storytelling, unflinching violence that even Tim Burton would avoid and an all around entertaining experience that I only wish the future DC live action movies could live up to. 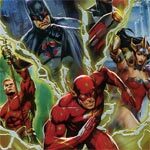 “Justice League” remains one of the best animated series ever made with some great action scenes intermixed with compelling stories and character development rarely seen in the genre. This season is probably the best but the remaining two, under the title “Justice League Unlimited” are still fantastic viewing. With regards to the Blu-ray I’m happy to report we finally got a proper widescreen transfer.